To study geotropism and phototropism on seedlings, cut shoots etc. Has an electric clock movement revolving every 12 minutes.220v/50Hz. we have positioned ourselves in the midst of the most supreme manufacturers of clinostat in india. 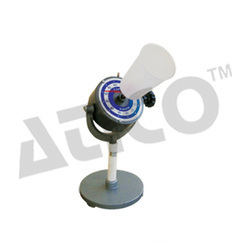 Our clinostat is manufactured from best quality raw material and thus lasts for a longer period of time. We offer both clockwork clinostat as well as electric clinostat. Our clinostat is accessible at minimum market prices.